Recorded in the two spellings of Aberdeen and Aberdein, this is a Scottish locational surname which does originate from the city of Aberdeen. Locational surnames by their very nature, were generally given to people after they left their original homes and moved elsewhere, although curiously this may not be the case here. 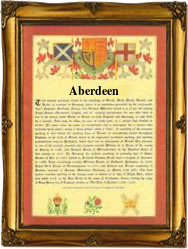 If not the original name holders may have been the holders of the manor of Aberdeen. Nethertheless it was in medieval times, and it remains so today, that one of the easiest forms of surname identification, was and is, to call a person by the name of the place, region, or country from which they originate. In this case the first name holder, see below, was a merchant who travelled between Scotland and France, and had the misfortune, whilst on his way to St Omer in France, to be captured by pirates in the north sea, and robbed of his cloth. Other early recordings include those of Michael de Abirden, a landholder in Berwick in the year 1290, and later John de Abirdene was the vicar of Pentland, Scotland, in 1399. Alexander Aberdein was a merchant of Aberdeen in the early part of the 18th century, and later still Jenny Aberdeen was a 20th century author who wrote the life of John Galt. The place name is probably Olde Gaelic pre 10th century. The derivation is from "aber" a river mouth, and denu, a valley or in this case, possibly an estuary. The first known surname recording is that of John de Aberdene, merchant of Aberdeen, in the year 1272.